President Donald Trump is under fire in Northern California not for the usual reasons – that Trump loathing is so intense in the region that many liberals think Sen. Dianne Feinstein’s saying Trump might someday turn out to be a good president is a fireable offense. Instead, two area Democrats fear the president has turned his back on Californians in the wake of last month’s wine country fires, which killed at least 43 people and destroyed more than 8,000 structures. This week, the White House fired back. White House spokeswoman Helen Ferre said the administration is “fully committed to assisting the victims of the California wildfires in their hour of need,” according to a report from the Chronicle’s Washington bureau. 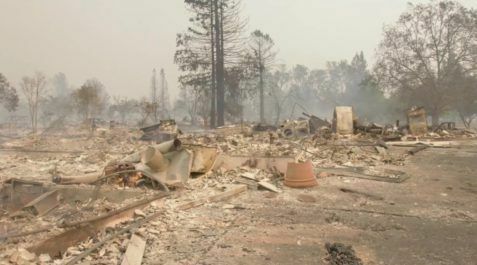 Ferre said the fine print on the $44 billion request showed that Golden State wildfire victims could expect to get part of $23.5 billion requested for the Disaster Relief Fund, which is overseen by the Federal Emergency Management Agency. But Ferre’s comments were unable to calm a larger furor over the administration’s disaster-relief request – one in which Texas Republicans and California Democrats made for a most unusual political couple, with both upset over what they see as a White House unable to grasp their needs. Texas has sought $61 billion to help the Houston region recover from Hurricane Harvey – more than eight times the $7.4 billion that Gov. Jerry Brown sought for California wildfire relief. With damages from Hurricane Maria in Puerto Rico expected to be bigger than Texas’ and California’s requests combined, there’s fear that the Trump administration will balk at the federal government footing huge bills in the wake of disasters. Texas newspapers have had days of headlines in which Republican Gov. Greg Abbott and GOP Sens. Ted Cruz and John Cornyn have teed off on the Trump White House. Abbott said its plan was “completely inadequate,” the Dallas Morning News reported. But a House Republican from Southern California could end up with a big say over the size of the relief package. That’s because Congress will ultimately decide how much disaster relief is appropriated, not Trump. While the president can veto a relief package, he can’t directly shape it. That’s why Rep. Thompson and officials from Sonoma and Santa Rosa counties have already begun lobbying Rep. Ken Calvert, R-Corona, who sits on the House Appropriations Committee, for his help. Only one House Republican signed the governor’s letter requesting $7.4 billion in federal aid – and it was Rep. Ed Royce of Fullerton, who represents the district just west of Calvert’s.